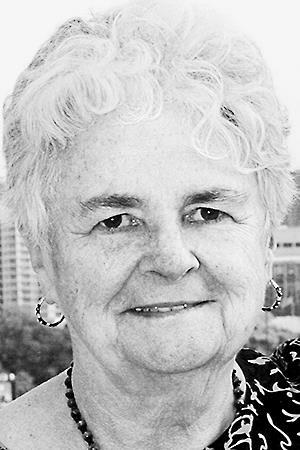 "Extending my sincere sympathy for the loss of your loved..."
SCARBOROUGH - Patricia Mary Clifford died peacefully on Sept. 3, 2018, after eight years of living with Alzheimer 's disease. Through these many challenging years, she faced the effects of the disease with bravery, dignity and a sense of humor. Pat attended St. Dominic's Elementary School and graduated from Cathedral High School in 1966. She continued her education at St. Joseph's College in Standish, Maine graduating with a B.A. in sociology. Upon completion of her undergraduate work she continued graduate studies at Boston College earning the degree of Master's in Social Work in 1972. Her lifelong commitment to social justice propelled her to Atlanta, Ga. She began her career with the State of Georgia Division of Mental Health to ensure that many disenfranchised groups could have a voice in improving mental health services across the state. Under her leadership, Pat's work built powerful alliances between many public and private organizations always with a vision toward quality improvement and expanding services for those who were underserved. As one of many examples, Pat was an early collaborator in founding Project Interconnections, a non-profit organization designed to provide shelter and support services for citizens with mental health needs. Begun in 1987, so compelling was the mission of the group that First Lady Rosalynn Carter agreed to serve as honorary chair. During her career, Pat always took the time to mentor new mental health staffers in their work. Pat shared her expertise as a consultant to the Federal Department of Justice as well as a variety of boards of directors. Given her dedication and appreciation of what she had learned at St. Joseph's College, she served on that Board of Trustees upon retirement. Despite her considerable professional accomplishments, Pat was not one who ever subscribed to an "all work and no play" ethic. Any who knew her could attest to her keen interest in "friendly" competionion whether on the soccer field, during a spirited game of poker or playing bocce ball on the beach with great nephew Liam. During less active times of recreation, you could always find her enjoying a few glasses of wine with her family of friends in Atlanta. Pat loved to travel extensively to places like China, Italy, France, England and Ireland, as well as all around the states. Pat is survived by her sister Jeanne Sawyer of Scarborough, a brother Michael Clifford of Scarborough; two wonderful nephews, Christopher Sawyer and his wife Barbara of South Portland and Erik Sawyer of Madrid, N.M. Especially cherished by Pat was Chris and Barbara's son, Liam Sawyer. Pat is also survived by her family of friends both locally and in Atlanta, the numbers are legion. Pat was blessed with loving and compassionate caregivers from Home Partners in Scarborough, Avita of Stroudwater, Westbrook and Compassus Hospice Care in Scarborough.